The start of this week’s carnival takes on a distinctly stellar theme. Fraser at Universe Today responds to a superb astronomical question from his young daughter that I am sure we have all wondered about at one point or another. Towards the end of March a massive Gamma Ray Burst (or GRB) was seen in the night sky. It was the brightest most distant GRB to date and one that was so bright it was visible to the naked eye! Dr. Ian O’Neill on Astroengine asks whether a peculiar type of star called a ‘Wolf-Rayet star’ could be responsible. Complementing this nicely, Ethan at Starts With A Bang! poses the question “Do all stars eventually explode?”. The Hubble Space Telescope has certainly found a star that will eventually explode. In fact, as Phil on the Bad Astronomy blog says, Hubble astronomers have caught a supernova in a galaxy right at the point it is beginning to ‘go off’. If a star is big enough when it dies it can form a black hole. Alan Boyle, of Cosmic Log, explores how new simulations of black hole interactions are showing the disparity between Newton’s and Einstein’s gravitational theories. With the release of the new Indiana Jones film a matter of months away, Rob carries out his own astronomy related archaeological investigation of a prehistoric site in Alabama in the USA, over at Orbiting Frog. Though as far as I can tell didn’t find any rats, sacred relics or hidden treasure! Meanwhile Chris Lintott reports from the Royal Astronomical Society’s National Astronomy Meeting (on the NAM blog) on the discussion held in Belfast on the current funding situation of UK astronomy and particle physics. One of the big tasks for those returning to the Moon and then looking forward to Mars is how we are going to carry out day-to-day tasks, like exercise and growing plants for food etc. Ken Murphy at Out of the Cradle explores how we might be able to grow plants in the lunar soil in part one of his post ‘Of a garden on the Moon’. Let’s hope when we get to the Moon or Mars they also have Internet access. For those of you that can’t get enough of Mars though the Martian Chronicles team have another update on the Opportunity Mars Exploration Rover, including a stunning panorama of the martian ‘Cape Verde’ rocky outcrop. When we do get to Mars maybe we will move our bases around with giant robots, Colony Worlds investigates what that might involve. And if you are new to the excitement of martian exploration then Stuart has some tips on how to survive your first Mars landing. Meanwhile, Bill Dunford at ridingwithrobots.org has an incredible animation of Victoria crater taken at different times (and illuminations) during a martian day. Centauri Dreams skeptically ponders whether the SETI program should search for extraterrestrial constructions known as Dyson Spheres, and asks if any other potential civilizations around other stars think like we do. Clearly when we humans want to venture out into space we are going to have to develop new technologies. Next Big Future has an article on how carbon nanotubes may be used in future space power and propulsion system whilst Henry Cate reports from Space Access 2008. Music of the Spheres blogs about the 2008 Space Expo at the New England Air Museum. 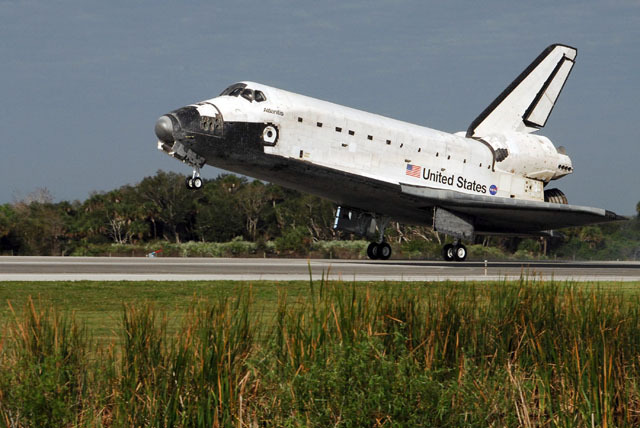 Even though the Space Shuttle simulated flights made by visitors to his stand might not have had the smoothest landings that NASA has seen, their educational value was worth it all. A Mars Odyssey also brings us up-to-date on the launch of the Soyuz from Baikonur on the latest ISS Expedition 17. Well that’s about it for this week’s Carnival of Space, remember that you can find a list of all previous carnivals on the Universe Today website. Great to come across your superb website. I’m also from the South-West, nice to see a lot of lively astronomy going on in the homelands, will link to your blog. Pingback: Is Dark Energy the same as Acceleration? | Starts With A Bang! Thanks for including my “Mars Landing Survival Guide” in this week’s Carnival! Go Phoenix!